School holiday is here. My Little Angels were so excited to spend their very long school holiday with something to explore, to learn and to enjoy. If you haven't made any plan yet or still not sure what is the best activity for your little ones, then you might want to bring them to Sunway Lagoon as they are all poised to raise the bar in holiday fun and excitement with its "Waves of Fun" campaign which promise a splashing good time for the whole family from 21 November 2015 to 3 January 2016. As early as 9.55 every morning, all visitors to Sunway Lagoon will be graciously received with an energetic and fun opening dance performance, meet-and-greet session with the park's professional dancers, clowns, stilt walkers, famous icon characters such as Peter Pan, Lady Gaga, Michael Jackson and Sunway Lagoon's very iconic mascots, Captain Quak and Lady Quak ! The revelry continues from 12 noon to 5.30pm as Sunway Lagoon Water Park turns up the heat with a b-boy (breakdancing) dance performance, DJ pool party, a Carnival Parade and a Marching Band specially presented by Sunway Lagoon events team. For my Little Angels, Wildlife Park is their favourite place to go. Educational tour for Wildlife starting from 1pm everyday where Wildlife Rangers will feed the animals and explained the history, names and the characters for each animal at Sunway Lagoon Wildlife Park. These Rangers also promotes message on how we can help to stop poaching and cruelty of animals. A great education tour for my Little Angels. At 3pm, do watch the Wildlife Multi-Animal Show at 3pm in Wildlife Theatre where you can see cute and cuddly animals like small toothed palm civet, ball python and parrots performing little tricks. The best part is, all visitors include my Little Angels able to get up close with some of the world's wildlife animals, who have made Sunway Lagoon as their home. These include a new pair of White Lions, Zola and Zuri. The white lions are a great addition to the Sunway Wildlife Park's recent expansion plans that provide guests on how we can help to stop poaching and cruelty of animals. To align with the Cuti-Cuti Malaysia initiative, we have prepared new range of activities as well as promotions to encourage Malaysians to explore the exhilarating offerings right in their own backyard." said Sean Choo, General Manager of Sunway Lagoon. 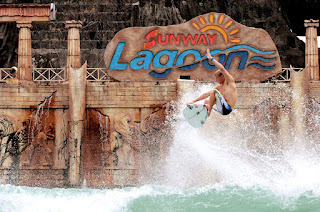 So, after reading my post here, if you're interested to go to Sunway Lagoon, let me disclose to all of you some of the promotions to Sunway Lagoon happening now that shouldn't be miss. Free admission into Sunway Lagoon for a period of a week from your birthday, along with a meal voucher worth RM10, redeemable at F&B outlets within the park.Up to four accompanying guests of the birthday boy or girl will enjoy 30% discount off the entrance fee. Sunway Pals members also get a free double tube to add to the merriment. To celebrate senior citizen, Malaysian Senior Citizens over the age of 60 are able to enjoy Sunway Lagoon for free. Visitors will get to enjoy 30% off on normal admission rate via Sunway Lagoon two online promotion packages awaits you i.e. Family Packages for 2 adults and 2 kids only at RM378 that also comes with complimentary RM10 retail voucher and meal voucher and 4 To Go for 4 adults admission tickets that cost at RM420 with complimentary RM20 retail voucher. Do check out the rate HERE. Only Applicable for purchases via the website with maximum two packages per transaction from 21 Nov 2015 - 3 Jan 2016. For more information on Sunway Lagoon, do call them at 603-56390000 or log on to Sunway Lagoon's website at www.sunwaylagoon.com or like their Facebook page at www.facebook.com/SunwayLagoonMalasia. Thanks to Sunway Lagoon for a great outing. Me and my Little Angels truly enjoyed ourselves so much here during the school holiday. There are still lots of rides that we unable to join on that day and we'll definitely come again to complete all. So, bring your little ones to Sunway Lagoon now and I'm sure they'll love it too as Sunway Lagoon not only bring fun to all, it also a place for your little ones to learn about the animals, understand them, love them, touch them and feed them all. It is indeed a great family getaway for this school holiday season. Fish, you should come to explore it and I'm sure you'll love it too. Miriam, u should pay here a visit again as lots of changes now with more exciting rides and activities. I have only been to the Lagoon once a long time ago and I have completely forgotten how it was so much fun. Should pay a visit there soon. Pen, you should as Sunway Lagoon had more to offered now. With the promotion, its worth to pay a visit now. Yay Sunway Lagoon sure makes me behave like a kid. Had so much fun with friends the other day. And the promotion is good too, with the school holidays. Bella. lets come and visit again and I'm sure you'll have the fun again. love this Sunway Lagoon, many places to play and see inside. Wanna go this Sunday to have all the fun. Henry, I don't like that ride as too challenging but my Little Angels enjoyed it. Miera, bring your daughter here and spend some times with her. It has been so long since I have visited Sunway Lagoon. Perhaps it is time to revisit. Thanks for letting me know of the latest attractions. Sunway Lagoon always have it all for the whole family during school holiday. So many fun activities to do there. Havent been to their theme park for a while now. Is the place packed with people since its school holiday now? My girls fav place. They can rides on the rides and play water in the waterpark. Nice place indeed. So fun at Sunway Lagoon and you can spend time with your family too. Havent tried the waterplex before is it exactly like 3D? Long time I didnt go sunway lagoon d. Really miss it now. Bestnyaaaaaa...I wanna bring my family someday. Sunway Lagoon! I haven't had the chance to really enjoy it with my family.. soon! Our local theme park ! It really has been a long time (2 years) since i've been back there!